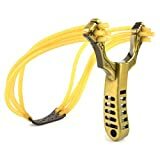 Best Slingshot Power Band - high quality really strong rubber bands, with make it one of the most powerful slingshots available. Top anti-rust stainless-steel; High-tension rubber band; Top leather wrapper;Top firing accuracy, frame. Slingshots are used both as recreational toys and for more serious pursuits. They can be great gifts for the little hunter-wanna-bes in your life. They can also be put to more lethal purposes such as against the creepy little deer in your backyard that refuse to leave your roses and tulips alone. Ok, just kidding! You wouldn’t want to use heavy ammo on a deer unless you had a slingbow, but tiny ball bearings would sting them enough to scare them away. Four of the best slingshots are listed below. The Talon Grip slingshot by Tauren has been updated with a newly designed power band for greater strength, making it one of the most powerful slingshots available. The fully adjustable steel frame makes it possible for you to customize the slingshot to better fit your hand while the molded grip provides increased ergonomics and comfort. The slingshot has been tested for durability and is sure to last for many shots. The first rule to remember is that a slingshot can be a very dangerous weapon and should be treated as such. In strong hands, it can become deadly. When shooting a slingshot, it is not a bad idea to wear eye protection. Projectiles moving at high speeds can ricochet off the target and strike you instead. If your eyes are in the way, you could lose your eyesight. Never aim your slingshot at something you do not intend to hit. If you do, you may regret the day you purchased the slingshot. A slingshot should be treated as though it is a loaded firearm. As with any other weapon, do not use a slingshot after consuming alcohol. Children should always be supervised when using a slingshot. Do not shoot at water, hard surfaces or at a 90-degree angle. Your ammo may ricochet and strike either you or something else you did not intend to hit. Be sure that you inspect your rubber tubing before each use. If the tubing is cracked or damaged, replace it before further use of your slingshot. The beauty of a slingshot is that it can accommodate variety of ammunition. Some of these are listed below. Steel shot is the most common type of ammo used with slingshots and can be used for target practice as well as for hunting. Steel shot is nearly impervious to damage and can be used over and over again. Larger sizes, such as one-half inch diameter, are large enough for hunting and are the preferred ammo for professional slingshot shooters. Steel shot is the most commonly used ammo for slingshot tournaments. If you choose to use rocks, pick those with a relatively uniform and round shape that are about one inch in diameter. The large mass of a rock this size will help to compensate for the imperfect shape. In order to accommodate rocks, the fork ends of the slingshot will need to be widely spaced to prevent damage. Marbles are readily accessible in toy stores and are an incredibly cheap source for slingshot ammo. They are highly visible and can be tracked during flight much like a tracer round. Marbles are easy to spot and are less likely to become lost than steel shot. The round, even shape of marbles makes them extremely accurate, but their low density decreases their killing power. If you need something cheap for target practice, marbles are an ideal choice. Lead balls are the heaviest of all slingshot ammo. This type of ammo is extremely popular among hunters who desire the greatest possible killing power. Although lead balls are rather expensive, you can drastically reduce the cost by casting your ammo yourself. Disadvantages to using lead include health risks and the softness of the material. Paintballs can make an excellent ammo for target practice. They do not ricochet and will pose no danger to bystanders. However, they are not reusable and are relatively easy to crush. If you decide to play paintball with a slingshot, keep in mind that slingshots can have greater power than a paintball marker. If you wish to use something a little cheaper than paintballs that still leaves a visible mark on a hard surface, consider clay balls instead. Clay balls are free, leave no dangerous shards and can be easily made out of pottery/sculpting clay. You don’t need to fire them in an oven; just let them dry out naturally in the sun. Hex nuts are quite cheap when purchased in bulk. For their shape, they are surprisingly accurate and powerful at short distances. Hex nuts must be centered in the pouch to ensure maximum accuracy. You could also use cylindrical pieces made from chopped iron rods or nails. This type of ammo is sharp and can cut your backstop and your hands. You will also need access to a saw or a bolt cutter to make this type of ammo. The hunting slingshot by Trumark Slingshots is suitable for all ages. The slingshot is easily adjustable and comfortable to use with a wrist stabilizer. The slingshot is designed to accommodate a Mini Maglite AA flashlight to permit use in low-light conditions. The fiber optic sights permit you to line your ammo up on targets up to 100 feet away. The optic sensors are able to capture light rays and use them to glow red and green to make target acquisition simpler. The clear plastic handle is hollow to permit the storage of slingshot ammo. As with the purchase of any slingshot, be sure to buy extra rubber bands for replacement when the original bands wear out. 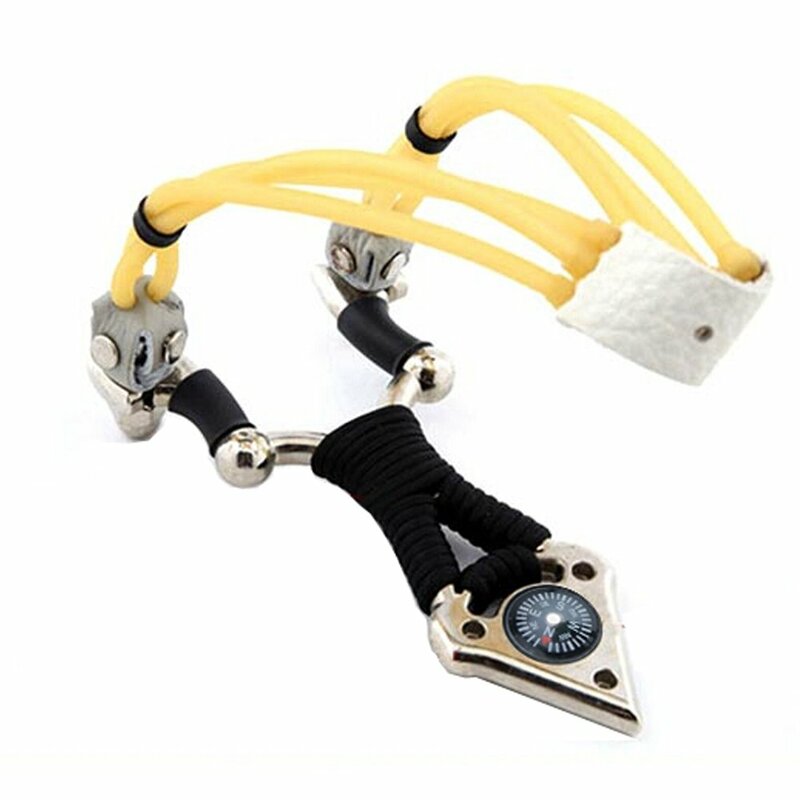 This slingshot is extremely accurate and easy to use. The rubber bands are supple and will not easily crack or break, making it perfect for a hunting slingshot. No ethical hunter wishes to make an animal suffer unnecessarily. Using shot large enough and bands designed for hunting will help ensure that you can quickly and humanely dispatch your game. You can also use the slingshot to place scent pads and pellets. When a hunter walks around in a specified area to attract deer to his stand, he leaves his own scent all over the area. If you use a slingshot to deposit scent pellets from any direction, you can decrease the amount of “human presence” that the deer will detect. Angle your body so that the toes of your support leg are facing the target in line with the slingshot. With your shooting hand, draw the slingshot pouch back to your cheek, keeping the slingshot pointing at the target. The rubber bands should remain parallel to the forearm of your support hand as you look at the target through the “Y” shape they create. Take your time in lining your slingshot up on the target. You can hold your Trumark slingshot in two ways in relation to the target: horizontally or vertically. When held vertically, you aim by shooting through the forks while estimating windage and elevation. If you hold the slingshot horizontally, you will use the bands to line your ammo up with the target. Visually placing one on top of the other under your dominant eye will take care of windage, leaving you with only elevation to compensate for. If you need to adjust your aim, do so by moving the arm holding the slingshot. Adjust your body accordingly. Do not allow the elbow or wrist of the arm holding the slingshot to slacken or droop while aiming at the target. You might be able to benefit from wearing gloves while using a slingshot to prevent the pouch from striking your skin after releasing the ammunition. Store your slingshot in a cool place protected from sunlight to extend the life of the rubber bands. There are four common types of elastics used in slingshot design: flat bands, tubes, office rubber bands and solid square strips. The most popular type of rubber is the flat band configurations. Flat bands are thin strips of latex that offer the highest level of performance among slingshot elastics. They are incredibly easy to cut to the right shape with a roll cutter. You can experiment with different types of band length, width and tapering to achieve the correct bandset ratio for your personal preferences. You can also attach multiple bands on each side of the slingshot for greater shooting power. Latex bands are easy to locate in stores that sell medical supplies and exercise bands. Many slingshot users like the Theraband brand of exercise sheeting in black, silver and gold. Rubber with a thickness of 1.5mm or more is called “gum rubber” by those in the slingshot community. Gum rubber is often used to protect heavy machinery from abrasion. Depending on the material and desired properties, gum rubber works best in thicknesses ranging from 1.5mm to 3mm. Gum rubber is less powerful than flat bands, but it has a longer lifespan. Many European slingshot associations use gum rubber in slingshot designs. Unlike flat bands, gum rubber is very difficult to cut. You will need a guillotine-style paper cutter in order to slice it to the desired length. There is a wide variety of rubber to choose from; one of the most well-regarded types is Linatex. Gum rubber is available from companies that supply industrial materials. Tubular bands are usually the first type of rubber that new slingshot shooters start with. 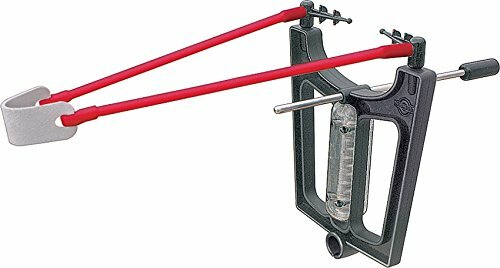 Most commercially-produced slingshots use tubular bands in their design. They are easily attached to the slingshot frame and have a high draw weight. The lifespan of tubular bands is high as long as the attachment method is low on stress. Tubular bands lend themselves well to Chinese-style slingshots. If you are interested in a cheap source of rubber for a homemade slingshot, consider common rubber bands. Although they are relatively fragile, rubber bands work well as an inexpensive solution. 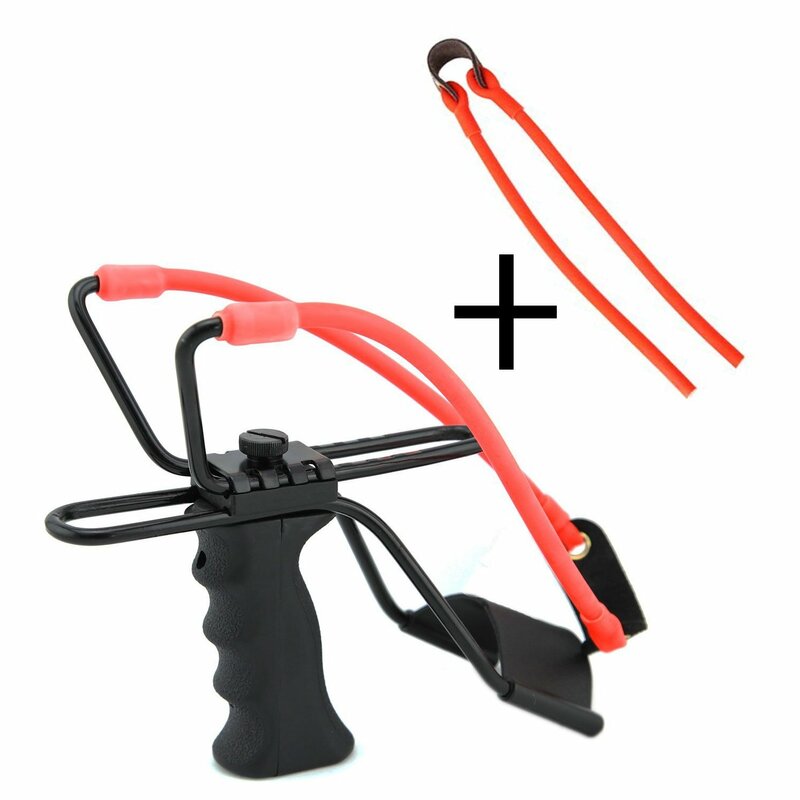 The HZman hunting slingshot with eight rubber bands is powerful enough to use for small game. The molded handle is designed to fit the shape of your hand for a more comfortable grip. The slingshot can accommodate steel balls, rocks, marbles and paintballs with ease for an eclectic shooting experience. The bands are sturdy and strong and will last you for many hours of slingshot fun. The slingshot itself is among the smaller designs and works well for small hands. Children and adults with small frames will find this slingshot easy to use. Using a slingshot to hunt is a low-tech, low-cost way to get out in the wild and learn the art of hunting without more cumbersome weapons like a rifle or a compound bow. Slingshots are lightweight, compact and easy to use. Virtually silent, they will not scare off any and all game for miles around after you take down one rabbit or squirrel. The use of a slingshot dates back to biblical times and the well-known story of David and Goliath. Early slingshots consisted of two strings connected by a pouch. The slingshot operator would whirl the pouch over his head and sent the projectile flying by releasing one of the strings. The slingshot design that we know today was only made possible by the discovery of rubber by Charles Goodyear in 1839. The inner tube of pneumatic tires was found to be the perfect material for early slingshot rubber bands. Size – Slingshots are small and can easily fit into a backpack or a pocket. Sound – They are almost completely silent in their operation and are excellent for a low-profile form of hunting. Weight – Slingshots are incredibly light and will add almost nothing to your load. Unlimited ammo – Although steel balls are best for slingshot ammo, you can also use any small stones that are ready at hand. The average hunting slingshot can drop pigeons, rabbits, pheasants and other small game at close range only. You will need to perfect your ability to stalk your prey before you expect to make a clean kill. Rabbits and pheasants especially have a tendency to freeze when they sense danger, allowing you to get close enough for a good shot. In some cases, you will even be able to take a second shot if the first one missed. Before you head out into the woods, you must be able to consistently hit your target to ensure a clean kill. Be sure to use high-quality steel balls for your game. These can range from 1/4-inch steel ball bearings to 1/2-inch slingshot ammunition. Practice with the type of ammunition you wish to use before you go out in the field. Be sure to take an extra set of bands out with you. It would be sad to lose an entire day of hunting due to a snapped elastic band. 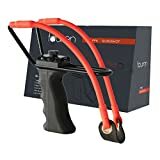 If you are interested in starting out with the slingshot but don’t want to spend a large sum of money, consider the powerful outdoor hunting slingshot by Ghaziman. The metal frame is designed to withstand the force of the bands when the slingshot is drawn. The rubber handle is slip-resistant and will not become slick with sweat. The durable rubber bands can last for up to 5,000 shots before requiring replacement. The paracord handle is easy to hold and includes a compass at the end. The triple bands are powerful and will send rocks, paintballs and steel shot flying. The Ghaziman slingshot is small enough to fit in your back pocket for easy transportation. Slingshots are not hard to make on your own, but they do require a lot of time, patience and skill. While metal slingshots such as the Ghaziman are the ideal choice for durability, you might enjoy making your own just for fun. Don’t waste your time looking for the perfect Y-shape as these are rare to find. A rough approximation is sufficient. Dogwood, oak and hickory are the best types of wood to use for a slingshot along with buckhorn. Once you have cut your shape, allow it to dry for three weeks minimum. For best results, let it dry for up to a year. If you wish to dry it faster, place the frame inside a plywood box with a 40-watt bulb on each end. The ultra-fast method involves the use of a microwave. Wrap the wood in a towel and microwave it for six 30-second bursts or until the wood stops hissing. Do not microwave it for longer than 30 seconds at a time; the wood will combust if you do. With the knife, place notches on each prong of the fork. Shave the wood away carefully until you have just enough room to hold your rubber bands. Wrap the rubber bands around each end of the Y frame. Tie the elastic off with wire or zip ties. To make the pouch, take a strip of leather approximately two inches wide and four inches long. Cut the corners to create an elongated octagon. Punch holes on each side of the pouch with an awl and run the elastics through the holes. Wrap the extra rubber around itself and secure it with dental floss or other fine string. You may need adjust the length of your bands to achieve the correct balance between draw weight and draw length. The wrist brace on some slingshots can make it simpler to use the weapon. The presence of a wrist brace reduces the strain on the hand holding the handle of the slingshot. Slingshots come in a wide variety of materials from plastic to metal. While plastic slingshots can be cheap, metal is more durable. Weigh your options carefully before making a purchase. The many different band configurations have their pros and cons. Multiple bands on a slingshot offer increased power, but the slingshot can be more difficult to draw back. Single bands are more likely to break over time, but they are easier for children to use. What is your intended use for your slingshot? Hunting? Plinking? Competing? Knowing what you expect from the slingshot can help you make a good decision. Slingshots are an economical and environmentally-friendly way to improve your aim and gain valuable skills along the way. Consider a slingshot as a gift to an outdoor enthusiast or for anyone who wishes to take up an ancient sport.